Drug-Induced Liver Injury (DILI) due to species-specific susceptibilities mediated by xenobiotic metabolism and/or the occurrence of idiosyncratic drug hepatotoxicity are among the most frequent type of adverse drug effects. Early identification of species-specific, adverse drug effects on the liver are important for increasing drug development efficiency. 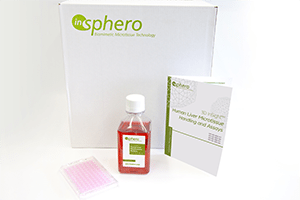 For our research partners, InSphero 3D InSight™ Liver Microtissues, developed using primary hepatocytes from human (multi- or single-donor) as well as custom models developed using relevant primary cells from animal species commonly used in toxicity testing, are available as monoculture hepatocyte models or co-culture models with Kupffer cells or NPCs. 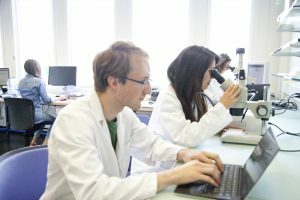 We provide specially formulated liver culture media that allows the direct comparison of obtained IC50 values among species, making this system an invaluable tool for DILI detection and the evaluation of pre-clinical species-specific drug effects in 3D liver microtissues. 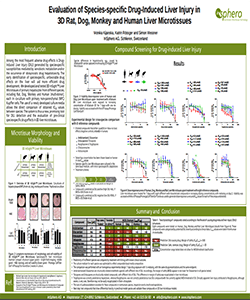 Compare DILI potential in human, rat, dog, and monkey liver microtissue models prepared from species-specific primary liver cells. 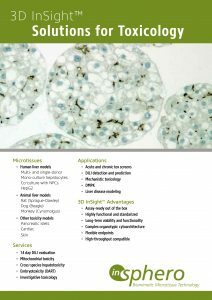 Please note that 3D InSight™ Animal Liver Microtissues are custom models available only to customers to use them on a regular basis for translational studies. 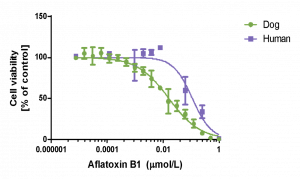 Viability dose-response curve of Human and Dog Liver Microtissues upon treatment with Aflatoxin B1. Liver microtissues were exposed to increasing concentration of Aflatoxin B1 for 7 days with one re-dosing. 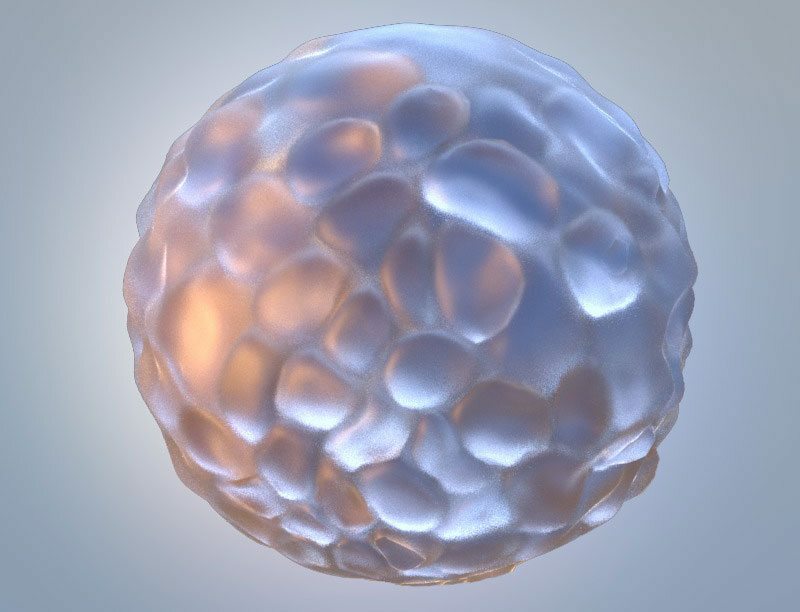 3D InSight™ Dog Liver Microtissues showed an IC50 value of 0.02 µM, which was 5.5-fold lower than for Human Liver Microtissues (IC50: 0.11 µM). This is in line with the reported high sensitivity of dogs to Aflatoxin B1 in vivo (1-3). Viability was accessed with the ATP assay (Promega CellTiter-Glo®).